✔ Yes, Tim! I want to legally steal the top stock recommendations and proprietary consensus picks of 200 of Wall Street’s top guns through your exclusive investment advisory service, Wall Street's Best Investments. If one of your 50 spots is still available, sign me up for the special discount savings below and begin my membership to Wall Street's Best Investments. • Complete access to the top stock recommendations of 200 of Wall Street’s top investing gurus—compiled, ranked and hand-picked by our editor Nancy Zambell, with full profit profiles on each recommendation along with each advisor’s proprietary buy, sell and hold advice. 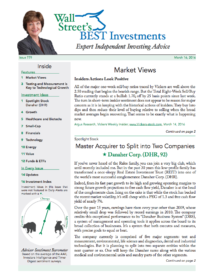 • Our monthly market update that will bring you over 30 top recommendations per issue. Plus, you’ll also receive follow-ups when one of our featured gurus makes a change in his or her holdings. • Daily Investment Alert, featuring the best stock-buying opportunity in the market, culled from the more than 200 recommendations these top guns send us daily. • Head-to-head market views from top contributors so that you can get a better grasp on where the economy is heading by being able to compare and contrast their economic overviews. • Early Warning Alerts. Benefit from the advisory's sentiment barometer that can pinpoint both market and sector changes long before you read or hear about them in the financial media. • The Guru Consensus. Because we have immediate access to everybody’s top picks, Nancy is able to give our readers something even greater than their individual recommendations: their consensus picks as well. • 24/7 access to our private Wall Street’s Best Investments website, reserved exclusively for Wall Street’s Best Investments Members containing our most recent issue and alerts, your FREE special reports and forecasts, and our archive of our past issues and reports that you can always access with the click of a mouse. • PLUS a complete refund if you’re not 100% satisfied with your results in the first 30 days. If you decide to join us on a monthly basis, just advise us when to terminate your membership and we’ll cancel it before the next monthly charge.